It’s time for another Cute Outfit Ideas of the Week! This edition is dedicated to those fabulous and fun Holiday parties. The Holidays are in full swing, which means so are the Holiday parties. It can sometimes be difficult to know what to wear to a party, but the first thing for you to find out is the dress code. When it doubt, always dress up a notch. It’s better to be more dressed up than everyone, than wearing jeans while everyone else is in a party dress. 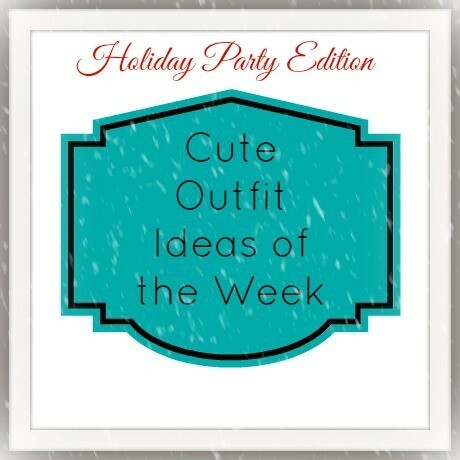 Here are a few cute outfit ideas for those Holiday parties. I created dressy outfits and one on the more casual side. But they’re all super cute! Which Holiday party outfit idea was your favorite? The first skirt is called the Champagne Drip Skirt. Does it get any better than that? I’m also loving the green damask dress because that pattern and color are just fantastic. I would wear the sequin shirt under a red blazer in a heartbeat! I hope you enjoy your parties and feel fabulous while celebrating the season. I really love the skirt in the first outfit, it’s so pretty & unique!